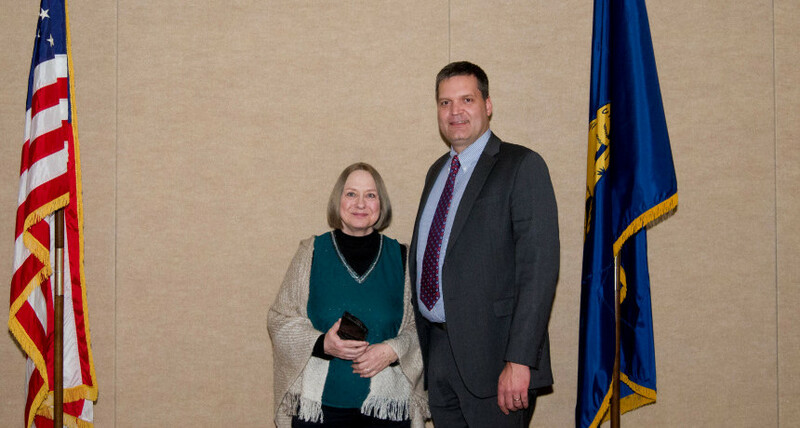 Our very own Terry Bright was recently honored by the Oregon State Sheriff's Association as the Civil Manager Of The Year! Below are excerpts from her nomination letter. We are so proud of her and her excellent service to the Sheriff's Office and the people of Hood River County. "Chief Civil Deputy Teresa Bright has singlehandedly run the Hood River County Sheriff’s Office Civil Program since February of 1986. During her tenure, Terry has worked for three Sheriff’s and has seen the office transform in a myriad of ways but has always maintained the stability of the Civil Division. As of 2017, Terry is processing over 1000 civil papers annually, on top of her additional duties as the HRCSO payroll clerk and spending time assisting the public with daily business office needs. Ms. Bright consistently has a positive attitude and has established herself as a go to knowledge bank within the organization. If Terry doesn’t know the answer, she will find it, always keeping the Sheriff’s Office in compliance and ensuring deputies are getting papers served in a timely manner. If a civil action requires that deputies will be in a potentially dangerous situation, she makes sure to inform those involved of any potential threats or safety issues, before they go into the field. Terry’s positive attitude and attention to detail ensure the HRCSO’s Civil Division is trusted and respected not only within the organization but with the citizens that they serve."